An ANC meeting in Northdale on Monday night became heated when an Msunduzi PR councillor was allegedly physically attacked. 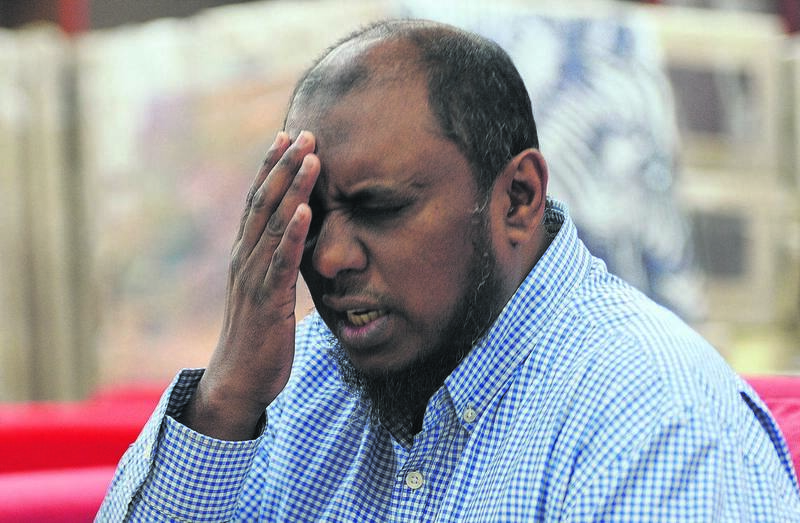 ANC PR councillor Mehmood Oumar, who was at the centre of the fracas at the ANC constituency offices on Bombay Road, claimed he sustained minor injuries as a result of being headbutted. A case of common assault has since been opened at the Mountain Rise police station. Oumar clashed with the Sector 4 Policing chairperson Sunil Beharie. He said the physical altercation ensued after he remarked that Beharie, who is not an ANC member, was not supposed to be at the meeting. Oumar told The Witness on Tuesday that he asked councillor Rachel Soobiah, who was chairing the meeting, to ask Beharie to leave. “I only asked what he was doing at the meeting because he doesn’t belong to the ANC. I wanted to know why he was seated in a meeting of this stature when we were discussing strategies going forward,” Oumar said. Oumar said as he was still on his feet waiting to respond to utterances by Soobiah, Beharie — who was standing a few seats away from him — started to point fingers and swear at him. “He was calling me all sorts of names. He initially agreed to leave. As he was walking past me, he head-butted me and continued swearing and showing me his middle finger as he walked out of the venue,” he said. Oumar, who had a slight swelling above his right eye, said he retorted by pushing Beharie away from him during the attack. He said it was not the first time that he had clashed with Beharie. Oumar said last month, when he attended the South African Minority Rights Equality Movement (Samrem) meeting in Raisethorpe, Beharie was among the people who heckled and kicked him out of the hall. “I don’t believe that someone who was together with Samrem members that removed us from the last meeting should have been allowed into an ANC meeting. How was he allowed into the meeting, when we know where he stands?” he said. Speaking to The Witness on Tuesday, Beharie vehemently denied assaulting Oumar. “There was no physical contact with him ... This is just a cheap shot at me,” he said. 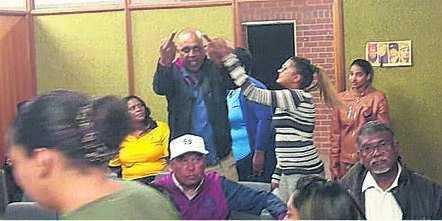 A photograph of Sunil Beharie showing Oumar his middle fingers during an ANC meeting in Northdale on Monday night. Beharie said Oumar was “upset” with him because he had kicked him out of the Samrem meeting. He said he had been invited to the ANC meeting by councillor Soobiah. “He asked if I was an ANC member and the councillor told him I had been invited as someone running the policing forum in the area. He, however, admitted to swearing at Oumar. “I swore at the statement he made about me belonging to the Samrem. I don’t belong to Samrem. Just because I attended a Samrem meeting doesn’t mean I’m a member. Even if I was part of Samrem, why is he making it a personal issue?” Beharie said. A witness who was at the meeting, who declined to be named, corroborated Oumar’s version and said that he had been head-butted. “He headed him, we all saw it. Councillor Oumar pushed him away and he started swearing at him. He threatened to hit him and started showing Oumar the middle finger,” the witness said. Soobiah confirmed that she had invited Beharie to the meeting but denied any knowledge of a physical altercation during the proceedings.